Fortnite is also taking over Marshmello’s merch. 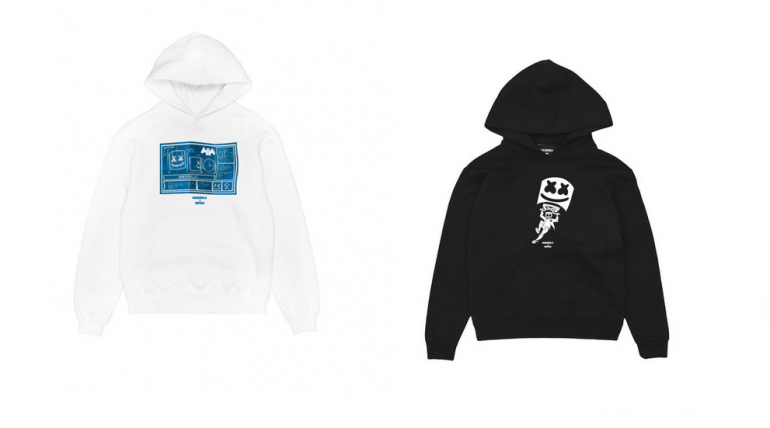 EDM musician Marshmello announced a new Fortnite merch collection yesterday to celebrate the new collaboration between his brand and the game. There are 20 items total, all of which blend the musician’s distinctive mask with several Fortnite elements, such as the Battle Bus, the Loot Llama, and a glider. There are four unique prints available. Loot Up shows Marshmello riding a Loot Llama; Beats from Above has Mello dropping from the sky with his glider; Blueprint is a Mello version of the iconic blueprint Fortnite loading screen; and Mello Battle Bus shows how the Fortnite Battle Bus would be if it had a Mello-themed balloon. Any of these prints may come on hoodies, shirts, t-shirts, and youth t-shirts and hoodies. The products range from $28 to $55 and were revealed right as the hype for the Marshmello and Fortnite collaboration nears its peak. Marshmello made his first appearance in Fortnite yesterday with the reveal of his Showtime challenges, which are literally setting the stage for his in-game performance on Feb. 2 at 1pm CT. Late last night, developer Epic Games revealed a Marshmello outfit and glider that the company made available for purchase at the in-game Item Shop, along with the dance emote Marsh Walk. Expectations are now high for what’s really coming. Feb. 2. Leaks revealed that there might be a new Limited Timed Mode related to Mello’s performance, but they also showed us a bit of the assets and songs that will probably be added to the game.